PRSA is offering a Black Friday special to prospects the week of Nov. 25–30. Those who join PRSA National by Nov. 30 can choose a free one-year Chapter membership! That’s a $45 savings to join the Greater Fort Worth Chapter of PRSA! 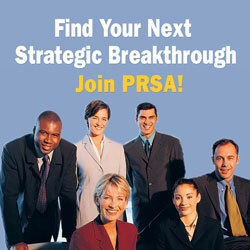 For more information, visit http://www.prsa.org/JoinUs/HowToJoin. Join the Greater Fort Worth PRSA Chapter as it explores “the PR Classroom of the Future” during the group’s December luncheon. Texas Christian University professors Dr. Julie O’Neil and Margaret Ritsch, APR, along with University of Texas at Arlington professor Dr. Shelley Wigley will share their perspectives on changing technology, innovative classroom approaches, and what the public relations profession can expect from graduates of their programs. This luncheon, the last for 2013, will also feature the presentation of chapter awards and student scholarships, plus a special presentation by the chapter historian. Wednesday, December 11 • 11:30 a.m. to 1 p.m.
Dr. Julie O’Neil, associate professor and director of the School of Journalism and Strategic Communication graduate program, teaches undergraduate and graduate courses in public relations, research and evaluation, social media measurement and corporate social responsibility at Texas Christian University. Her areas of expertise include measuring and evaluating communication programs and corporate social responsibility. She has published close to 20 research articles and white papers in leading academic and professional public relations journals and is the recipient of many conference awards. A former PRSA Board member in both Fort Worth and San Antonio, O¹Neil currently serves on the Measurement Commission of the Institute for Public Relations, the editorial board of the Public Relations Journal, the International Public Relations Research Advisory Committee and as co-chair of PRSA’s National Research Committee. Margaret Ritsch, APR, is the faculty advisor for Roxo, a student-driven agency for strategic communication at Texas Christian University. This fall she also became a Coleman Fellow, a program of the Coleman Foundation and the Neeley School of Business that introduces students to concepts of self-employment and entrepreneurship. In her 20-year career, Ritsch has directed public relations and communications for a thriving ad agency, a science museum, two companies and a journalism association; worked as a reporter for newspapers in Virginia; and run her own consulting business while raising a family. Ritsch has provided strategic and tactical public relations services to clients in a range of industries, from a regional bank and pharmaceutical company to a natural gas industry group and a private foundation. Ritsch earned a master’s degree in journalism and a certificate in African Studies from the University of Wisconsin-Madison and a bachelor’s degree in English from the College of William and Mary. She has served in a variety of leadership positions with the Greater Fort Worth Chapter of PRSA, most recently as leader of the Worthy Awards. Dr. Shelley Wigley, assistant professor of public relations at The University of Texas at Arlington, teaches courses in the undergraduate public relations sequence and currently teaches Theories of Persuasion at the graduate level. Wigley’s research interests include crisis communications, corporate social responsibility and media relations. She has published articles in several journals including Communication Monographs, Communication Research, Public Relations Review and Corporate Reputation Review. Wigley earned a bachelor’s and a master’s degree from Oklahoma State University, and a Ph.D. from the University of Oklahoma. Share the gift of PR knowledge! Join GFW PRSA for happy hour! Share the gift of PR knowledge! Bring your favorite PR book (or an extra copy) to the GFW PRSA gift exchange. Contact Lisa Albert at l.albert@tcu.edu by Dec. 9.
https://fortworthprsa.org/wp-content/uploads/2013/11/TBA-12108-HolidayGraphic-851x315.png 315 851 Andrea Hunt http://fortworthprsa.dividesignpros.com/wp-content/uploads/2019/01/GFWPRSALogo2018-300x287.jpg Andrea Hunt2013-11-13 17:31:472013-11-13 17:31:47Share the gift of PR knowledge! The front page of the New York Times business section really woke me up this morning. 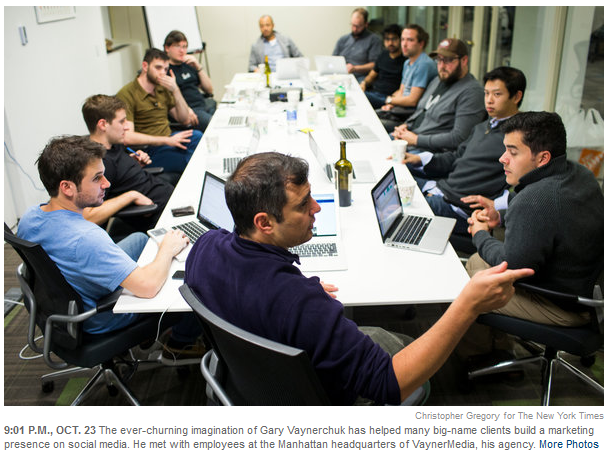 The photo showed a dozen guys — all white, one Asian — around a long conference table at VaynerMedia, the fast-moving Manhattan agency owned by social media genius Gary Vanuchek. No women in the photo? This is the year 2013, right? I got a fast response from Gary himself after tweeting about it. It seems the NYT photographer took a lot of photos that day. Gary was clearly upset — he explained his company’s top two executives are female and he sent me another company photo in which both women and men are jumping up and down in some sort of celebration. It occurs to me that some good old-fashioned public relations might have been helpful to Gary and his firm during this important visit from the New York Times photographer (who, I noticed, was a guy). Stick with the photographer like white on rice. Make sure any photo that gets taken inside your company shows the picture you want the world to see. There’s no excuse in this day and age for 12 white guys to be sitting around a conference table, especially in a youthful industry like social media/digital. None. If you are uncomfortable “handling” the photographer because it feels too controlling, then let a public relations expert handle it. You have invested a lot in your company. You may not be able to control how the story turns out, or which photo runs, but you can supervise the photographer inside your company to make sure any images taken reflect well on your company. It is likely that Gary Vaynerchuk and his company’s fortunes will continue to soar despite this mishandling of a superb news media opportunity. But the ladies inside that company may need some TLC, Gary. I’d say, a mani-pedi day might be a good start this week. Visibility and recognition would be the better reward. Dr. Joe Trahan spoke at the GFW PRSA Professional Development Program on October 9 at Colonial Country Club. During his presentation, Dr. Trahan said the three p’s of good speeches are people, purpose and passion. Senior PR practitioners gathered around Dr. Joe Trahan at an Oct. 8 mixer at Lucille’s Bistro, where he made an appeal for mentorship of junior-level professionals and discussed the need for ongoing continuing education.